I recently added a new question for my CEOs when we kick off a CFO search. It is simple, but is proving to be very helpful: What is it you do not like about executive recruiters you have worked with, or about the process? Mike Farley, the Founder of Tile, Inc. sat back and laughed a bit when I asked him. Then he thought for a second and told me he feels that most recruiters rely on their candidate databases too much and do not make enough of an effort to recruit fresh talent. This was surprising to me to hear and I took it to heart. Mike’s frustration is not misplaced. What do recruiters do when we have a new mandate? Certainly, we quickly start going through our mental list of people we will call once we have agreed upon the specification. When I ran a large recruiting firm one of the things we prided ourselves on was a huge candidate database with a very sophisticated search algorithm to sort out different candidates’ technical attributes. Having a large database can create a false sense of security that everyone who is qualified for this role is already in the database (or one’s personal LinkedIn network). But because each search is unique, I believe each search deserves a fresh approach to identifying the right set of candidates for a specific client. The bottom line is that recruiters should actively recruit, not re-hash a database. Of course, I preach that my network of CFOs is big and strong and nationwide. And it is. 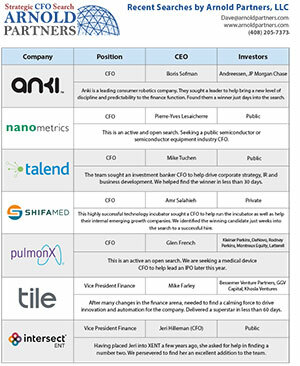 But certainly, I do not know every CFO in technology. It is a constantly changing universe and would be impossible for anyone to track accurately. I think understanding how a CFO likes to be approached about a new opportunity may be a more valuable asset than having tons of contacts in a database. After all, what good are names and contact info if you cannot deliver a winning presentation and deliver high quality candidates to the opportunity? Having a strong database is important no doubt, giving the recruiter a jumping-off point. It is a collective of industry sub-components, and specific individuals will lead to others of a similar ilk. But like Mike, I think it is critical to think about the present as well as where things are going in the future, especially in technology industry searches. It is critical to reach out to the up-and- coming generation and to re-invigorate the database with every new search by asking respected and trusted contacts for great referrals, and by reaching out to those folks that are 3 times removed as well. When we presented the short list of candidates to Mike, I was proud to say that prior to initiating the search, I had never met any of the five people on the list. This is what recruiting is all about. It is what keeps it interesting for me personally and professionally. Reaching out and beyond the comfort of who I know today to the folks I want to know tomorrow. I will continue asking each CEO I meet with what bugs him/her about executive search consultants. I am sure it will be a different pet peeve with each one, who knows. Maybe a theme will emerge. The great thing about being an entrepreneur within the search industry is that with each new search, each new CEO, and each new specific mandate will be the challenge to find that rare, exceptional, standout person for my client. And the way I go about doing that is not formula driven. It is as unique as the role and each CEO. It is not data-base mining, it is truly recruiting! What bugs you about executive search and the way it is conducted? I’d love to hear. Email me at dave@arnoldpartner.com.